Stand-Outs are made from 3/4" thick gatorboard and have black edging on all four sides that covers the open foam. They a very lightweight but stiff and durable. There are holes on the back for simple wall hanging flush against the wall. Since the print is not covered by glass or acrylic, we recommend that it be laminated for protection from fingerprints, dust, water and UV fading. We stock these in most standard sizes. Turnaround time for printing, mounting and laminating is 1-2 days. 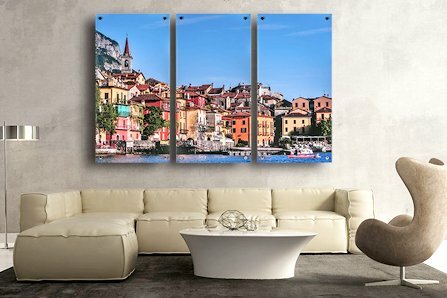 Mural Mounts are made exactly the same as Stand-Outs except they are 1.5" thick, twice as thick as Stand-Outs. Stand-Outs: 5x7, 8x10, 8x12, 10x15, 11x14, 11x17, 12x18, 16x20, 16x24, 20x30, 24x30, 24x36, and 30x40..
Mural Mounts: 8x10, 11x14, 11x17, 12x18, 16x20, 16x24, 20x30, 24x36, 30x40, 36x48, and 40x60. Custom sizes can be made by special order (two to three weeks). Call for a quote. Prices are listed on the Mounting and Laminating Page, and also in the downloadable Complete Price Guide on the Print Mounting page 38. 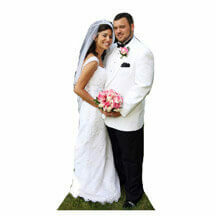 The Order Now button will take you to the enlargement and poster print ordering pages. 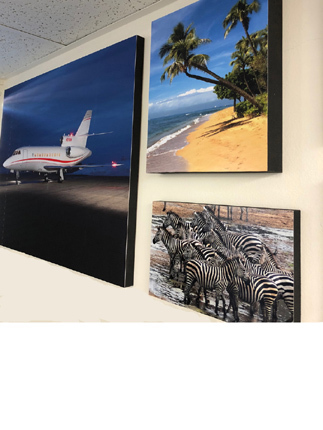 The Stand-Outs and Mural Mounts can be added to your print order by selecting them in the Print Mounting Options on the order page.